last year I was asked (albeit last minute!) if I'd like to contribute to a book tentatively called Videoblogging Hacks so I wrote up the following rather quickly and sent it off. I'd been playing with creating html links and href tracks previously and I think I'd mentioned it on the videoblogging yahoogroups list. anyway, the book was published and is now available from various online stores. 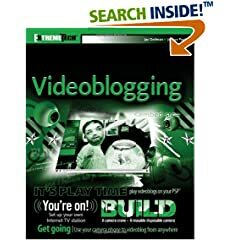 the book is called Videoblogging and the authors names are Jay Dedman, Joshua Paul. I received a copy and had a quick look through it on my last trip home to Sydney - it's a very throrough book! so grab a copy if you get the chance. my section was cut/edited quite a bit. I was surprised it made it all. so below is what I sent through - I need to find the images and post/links them also. it's a useful reference for me also, but most of the info below is already available on the internet. I did find it hard to locate information at the time, so this was a way of bringing it altogether in one place as a reference. attached are the doc and rtf versions - hopefully the images show up in them. I can't see them here on the mac but perhaps I don't have the correct viewer installed. Creating Clickable Hyperlinks in QuickTime video movies. Everybody knows that html links, or hyperlinks make the internet go 'round. Wouldn't it be cool to include clickable links in the video files you create and publish also. Think of the possibilities! Depending on what your video content is, the links could enhance the viewers experience whilst watching your video and allow them to gain more information or visit your homepage once they've finished watching your video. Clickable links turn your video file into an interactive video. The Zen Garden aims to excite, inspire, and encourage participation. To begin, view some of the existing designs in the list. Clicking on any one will load the style sheet into this very page. The code remains the same, the only thing that has changed is the external .css file. Alice is a modern programming environment designed to be a student's first exposure to object-oriented programming. It allows students to learn basic computer science while creating animated movies, simple video games, where students control the behavior of 3D objects and characters in a virtual world. Craftster is a forum for people who love to make things but who are not inspired by cross-stitched home sweet home plaques and wooden boxes with ducks in bonnets painted on... If you've been known to run with scissors, you can break the rules of crafting with your fellow rebel DIY'ers there!